I spend a lot of time online browsing the web, using various forms of social media, reading blogs, and of course writing my own blog. Dialogue: Through blogging and social media I am able to be in constant conversation with people from all over the world. I have blog readers from the United States, UK, Canada, Australia, France, Germany, the Netherlands, Turkey, Greece and Romania. I read blogs written by people from England, Scotland, America, Canada, Australia, Finland, France, Germany, Belgium and Sweden. It's amazing how I'm able to connect with such a diverse range of people who all share similar interests , just through the power of the internet. Support: There is, essentially, no vintage community whatsoever where I live. We have a couple of vintage shops and there are vintage fairs that take place a few times a year, but since I almost never see other vintage wearers (or at least those that wear vintage in a 40s or 50s style rather than a modern way), I suspect these fairs mainly attract people from neighbouring cities. For those of us who have no fellow vintage lovers to connect with face-to-face, the online vintage community can help us to feel less isolated from people who really understand why we get excited about metal zips or why we can sometimes be found rubbing and sniffing plastic bangles in charity shops*. (*I've yet to find any bargain charity shop bakelite, but I live in hope). Inspiration: One of my favourite ways of finding inspiration for outfits and vintage styling is to look at how other girls are wearing their vintage clothing today. Sometimes I want to create a period-accurate look, sometimes not. I like 80s-does-50s items and modern repro. Having access to the online vintage community allows me to draw on inspiration from a huge range of sources which includes, but importantly is not limited to, vintage photos. After all, as much as I adore the fashions of the past, I am a modern girl and I enjoy looking at what other modern girls are wearing. Shopping: Without the wealth of online vintage shops that I have access to, I wouldn't be able to have the vintage wardrobe that I currently enjoy. While I do buy some of my vintage clothing in vintage shops and at vintage fairs, I find that I can come by some vintage clothing a lot cheaper online (although I know this is not the case for everyone). It can also be difficult for me to get to vintage fairs as they are held at weekends and I have a weekend job. This year has been mad hectic with university work as well, so I haven't been able to shop much during the week. Being able to shop online in the evenings means I can shop in my own time, and from the comfort of my own home. Although I've put my reasons here into four broad categories which I've listed in no particular order, I think the most important thing for me (and really the inspiration for writing this article) is the support afforded through having contact with others who have the same interests as myself. I am in no way ready to give up wearing vintage; I will look this way for the foreseeable future. However, sometimes it can be difficult when I don't have any friends who dress like I do. I can take my non-vintage wearing friends vintage shopping with me (and have done, on occasion), but it doesn't always seem fair to drag people around shops for hours if they have no particular interest in the items for sale. It's harder for me to bounce outfit ideas off my non-vintage friends (for example how to wear a new item, what key item I need to buy to create a certain look). I don't mean to say that I only want to be friends with other people who wear vintage, but I think we can all agree that having friends who share and really understand your interests is a wonderful thing. 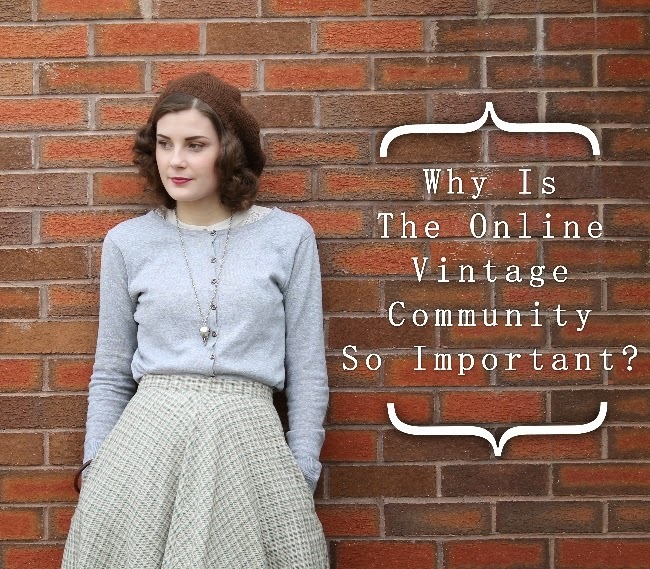 So, do you agree with my reasons for why the online vintage community is important? Do you have any other reasons for why the community is important to you? I'd love to hear your ideas! The most important thing for me, in regards to the online vintage community, is definitely shopping, with inspiration a close second. I live in a big city, so there are some great vintage stores around, but the ability to browse all of the online shops has really expanded my horizons. I also really appreciate all the time and effort that goes into the looks that vintage loving folks put together, and it makes me push myself to create fun and interesting looks myself in the real world. I agree with you completely, it's nice to know there's other people that think the same way and are also obsessed by vintage! I've been wearing vintage and vintage appropriate for awhile now, but in a very lonely way. It wasn't until recently that I discovered that there was a whole online community. This community has welcomed me with open arms and offered me so much inspiration. The fire of my passion has been fueled so immensely, and I feel I am truly finding my place. I understand what you mean by not having friends who share your vintage interests. I'm so glad that I have recently found 2 friends who share a love for the fashions of our past. Although the 3 of us have different focuses there is at least a common bond. Support: that's so true. I feel like I am a part of big family without any frontier, from all countries, all ages. And that's wonderful! I just recently found your blog and am going through your older posts. I totally agree with what you wrote. 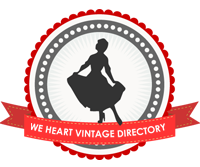 Vintage blogs and whole vintage community are such a good place to find inspiration. I have friends who wear vintage but since i cant hang out with them 24/7, online community is good continuum to that real life community. Also I have made friends in over the vintage blogh I follow. And I have made some of my best vintage finds via my vintage friends. Browsing vintage online also enhances your knowlegde about vintage. So yeah, definitely worth it. I really like your style and I'm so happy I found your blog.